Fancy having a go at growing your own produce? How do you improve your chances of getting an allotment? How do you plan what to grow? And what exactly is a cold frame? Find the answer to all these questions and more inside The Allotment Pocket Bible, the perfect gardening gift full of indispensible tips on how to grow your own herbs and veg all year round on an allotment. Full of practical advice on cultivating and enjoying your plot - whether you've got an allotment in the city, a patch in your garden or an area of farmland, The Allotment Pocket Bible gives gardeners tips from how to find and get different types of allotment to how to organise and manage your allotment space. There’s also valuable advice on what to grow (as well as a growing calendar to help you decide when to grow it), tips on edible flowers and fighting pests and diseases. As well as learning the many benefits of allotment gardening, you can also pick up time-saving tips and techniques from pruning to storing your produce. From greenhouses to polytunnels, all the essential information you need to know about allotment gardening can be found in this handy, easy-to-read and durable guide, helping you grow your own produce all year round. Inside The Allotment Pocket Bible you can discover the rising popularity of allotment gardening, as well as how to turn your allotment into a productive venture. Dip in to great ideas for fruit, vegetable and herb recipes made from your hard-earned produce, learn how you can get kids involved with your allotment projects and make sure you've got all the right tools and equipment to make looking after your allotment as easy as possible. From clearing your new allotment and planting raised beds to building compost bins and when to sow, plant and harvest your crops, you’ll find all the handy, easy-to-follow advice you need in The Allotment Pocket Bible. Want to start gardening organically and grow your own organic food? The Allotment Pocket Bible will help you grow your own organic produce: organic vegetables, organic fruit and organic herbs. Wondering how to make money from your allotment produce? Planning an allotment competition? 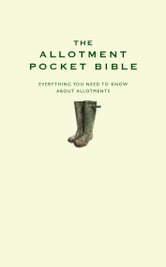 Find tips on all the rules and regulations you need to know, as well as how to engage with the allotment community and maintain relations with allotment neighbours..
Small and durable and perfectly designed to be used ‘on the job’, The Allotment Pocket Bible is sure to be your trusty companion on your next visit to the potting shed. "Cultivate the garden for the nose, and the eyes will take care of themselves." "All my hurts my garden spade can heal"
"Gardening is the purest of human pleasures"
Other titles in the series: The Allotment Pocket Bible, The Baking Pocket Bible, The Cook's Pocket Bible, The Mum's Pocket Bible and The Outdoor Pocket Bible.